A Chinese Long March 3B/E launched the the TKSat-1 satellite for Bolivia on Friday. 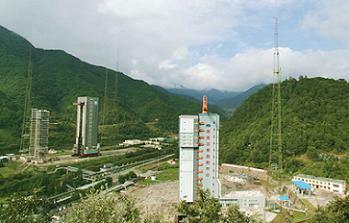 The launch took place at 16:42 UTC from the LC2 Launch Complex of the Xichang Satellite Launch Center, Sichuan province. 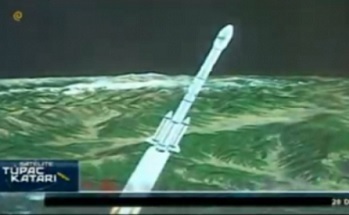 This was the first Chinese orbital launch since the failed launch of CBERS-3, on December 9. TKSat-1, also known by Tupac Katari, is the result of an agreement signed on December 13, 2010, by the China Great Wall Industry Corporation (CGWIC) and the Bolivia Aerospace Bureau. The contract for the Tupak Katari Communications Satellite Program was signed in La Paz, the administrative capital city of Bolivia. Mr. Ivan Zambrana, Executive General Director of ABE, and Mr. Yin Liming, President of CGWIC, executed the contract as the representative of each party. According to the contract, CGWIC was responsible for delivering the Tupak Katari communications satellite into orbit and the relevant ground application system to Bolivia. The satellite was developed from the DFH-4 platform, which is manufactured by China Academy of Space Technology (CAST). With 30 transponders on board (26 Ku-band, 2 C-band and 2 Ka-band), the Tupak Katari satellite is designed for a 15 year mission duration. The contract also included the launch of the satellite using the Long March-3B/E launch vehicle developed by China Academy of Launch Vehicle Technology (CALT), from Xichang Satellite Launch Center (XSLC). 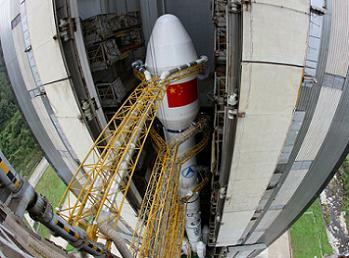 China Satellite Launch & Tracking Control (CLTC) were responsible for the ground segment. Tupak Katari will begin orbit operations at 87.2 degrees West longitude in March 2014. The satellite’s launch mass was 5,100 kg, with 30 transponders, four of which will be used for TV transmission only and the rest for transmission and reception. The satellite will also service Venezuela, Colombia, Ecuador, Peru, Bolivia, Paraguay, Uruguay, North of Chile and Argentina, and the East of Brazil. The spacecraft is the first communications satellite of Bolivia. 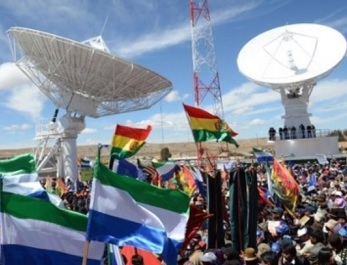 It will not only provide communications and broadcasting services to the whole territory of Bolivia and the surrounding areas, but also facilitate the development of civil projects like remote education and telemedicine. As part of the contract signed with Bolivia, a group of Bolivian specialists were sent to China to train for the operation of the new satellite, which they completed on October 28, 2013. With the development of China’s space industry, space training is gaining increasing popularity among a vast number of international customers, and has become an important part of the whole satellite export projects of China Space. Since 2005, CGWIC has completed a number of successful training programs for its international customers as part of its whole satellite export projects, helping foster hundreds of satellite engineers for such countries as Nigeria, Pakistan, and Venezuela. This was the sixth communications satellite orbital delivery contract signed by CGWIC with international customer. 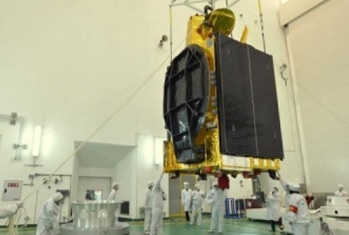 China Development Bank provided commercial loan support for Tupak Katari satellite program. Born Julián Apasa Nina in 1750, Tupac Katari, was an early leader of the independence activists in Bolivia and a leader of the indigenous people in their fight against the colonialism of the Spanish Empire in the early 1780s. It was a member of the Aymara, and it took the name “Tupac Katari” to honor two earlier resistance leaders: Tomás Katari, and Túpac Amaru II. Eleven seconds after leaving the launch pad, the Long March-3B/E executed a pitch-over maneuver, orienting the vehicle on the desired launch azimuth. The four strap-on boosters separate at 2 minutes 20 seconds into the flight, with stage 1/2 separation coming 48 seconds latter. Fairing jettison took place at 3 minutes 56 seconds. The second stage burns until 5 minutes and 44 seconds, when 2/3 stage separation occurs. Third stage will conduct its first burn until 10 minutes 13 seconds. After this the launcher will coast in this initial parking orbit until 20 minutes 56 seconds into the flight when the third stage engine starts its second burn. This burn last 3 minutes and 1 second and is followed by an attitude adjustment phase. Spacecraft separation took place 25 minutes 42 seconds after launch. 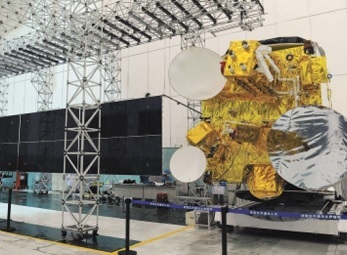 The CAST manufactured DFH-4 (Dongfanghong-4) platform is a communications satellite bus featuring high capability and a long operational lifetime. It sports an output power and communication capability equivalent to the similar international bus specifications, and consists of propulsion and service modules, solar arrays and 3-axis stabilization.